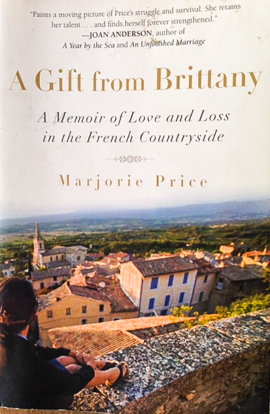 My first book of 2016 was A Gift from Brittany, by Marjorie Price. It’s a true story, the account of the young American’s own life in southern Brittany in the early 1960s, back when modernity had not yet reached these rural communities and when there were no other expats to be found. What I did not realize when I first picked up this book is that the author’s Brittany is the Morbihan. La Salle, her hamlet, is only about a half hour by car from Baden, where I stay when I am out there–just on the other side of Vannes. What is so captivating about Marjorie or “Midge”‘s story is that it’s all true. She is writing about her own experiences and her own feelings with respect to her relationships with the others in her life and her relationship with Brittany. Midge did not start out as an author. Her real passion was and still is for painting. She fell in love with a French painter, married, had a daughter, and moved with her husband–largely on her husband’s insistence–to a remote village where she had seemingly no ties at all. And yet, she ended up forging one of the strongest human bonds of her life there. Although the Brittany I know is much more connected to the outside world, there are still so many pieces of Marjorie’s writing that click with me, that seem so familiar. If you are at all familiar with Brittany and its culture, I think you will feel the same. Even if you have lived elsewhere as an expat, I think you will find many familiar aspects to Marjorie’s story. I highly recommend reading A Gift from Brittany. But if you’re unsure, read the prologue and Chapter 1 from Majorie’s website and then decide. I am sure you will be hooked! You can learn more about Marjorie Price’s artwork on her website. Marjorie has also authored a couple of short stories that you can access through her site. Be sure not to miss Majorie’s photos of La Salle and her time there.